Length: ~45 cm (18 inches). In Thenaturalamber.com website we offer about 500 unique jewelry for adults. Our product assortment for adults consists of traditional and exclusive necklaces, bracelets, rings, anklets, pendants, souvenirs, Christian rosaries and more. All our jewelry is made only from 100% genuine Baltic Amber, which comes from Lithuania. Our products can be purchased at both retail and wholesale prices. 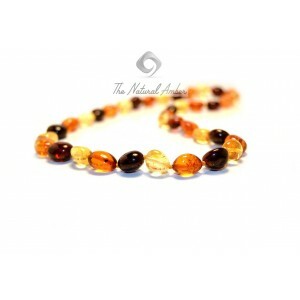 Each necklace or bracelet is knotted in between each bead and on the end there is a Plastic clasp with a screw.